Payment behaviour in the ICT sector has been good over the past two years, and the number of payment delays and insolvencies is expected to remain low. South Korea accounts for about 20% of global semiconductor production and 60% of memory chips manufacturing. Both segments recorded high growth over the past 12 months. This, together with robust exports of microchips used in smartphones, computer servers and data centres, strongly contributed to a GDP growth of more than 3% in 2017. 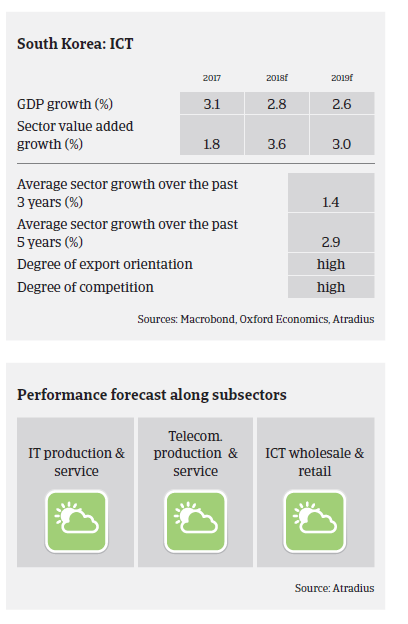 The ICT growth outlook remains positive in 2018 due to further export expansion, higher spending by the public sector and rebounding consumer confidence. The sector is dominated by a number of large, family-controlled industrial groups (chaebols). Despite the concentration of bigger players, the sector is very mature and still considered highly competitive. Even with some downward pressure, profitability of the sector is expected to remain generally stable in 2018. In the South Korean ICT sector equipment for information, communication and broadcasting accounts for 73%, services for 16% and software for 11%. This reveals the industry’s overwhelming dependence on hardware, failing to keep pace with the global trend of focusing on software. However, the South Korean government has begun to sharply increase investment to support R&D in areas like autonomous cars, Artificial Intelligence, Internet of Things-fitted electronics, semiconductors and displays. While gearing and dependence on bank loans are still high in this sector, financial institutions are in general supportive of most businesses, and the overall indebtness of the industry decreased in 2017 compared to 2016. Corporate borrowing rates are rather low, and companies have diversified borrowing funding sources (e.g. banks, bond market etc.). On average, payments in the ICT industry take between 60 and 120 days. In general, payment behaviour has been good over the past two years, and the number of payment delays and insolvencies is rather low. Our underwriting stance continues to be open for ICT businesses, supported by the good availability of financial and business information and the stable track record for the past few years. Main downside risks are rising protectionism of the main trading partners (China, US), and strong competition from neighbouring countries such as Japan. China is rebalancing its economy away from exports and investments towards consumption. This is weighing on GDP growth of its trading partners. The high level of household debt remains a downside risk for the economy, together with a tougher competition from China in a range of industries.